Excel does a great job as a spreadsheet, but when you try to push it into service as a database you may be in for some rude surprises. Need to get the scoop on the latest software tools and trends? You've come to the right place. Get one reviewer's opinion of Certify’s test automation tool for nonprogrammers. When taking on a new job or even a new project, the sheer number of tasks can seem overwhelming. Find out how a few stacks and applied prioritization can help you cut through the clutter and clear a path to success. Turn to The Last Word, where software professionals who care about quality give you their opinions on hot topics. This month, see why it is important to keep your plans up to date. We're pleased to bring you technical editors who are well respected in their fields. Get their take on everything that relates to the industry, technically speaking. 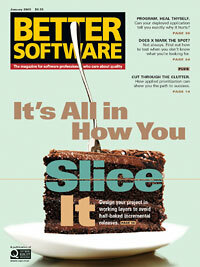 In this issue, read about the changes we're making to Better Software this year. Even the healthiest applications don't always thrive in new environments. Deployment errors can occur despite extensive testing—and can be very difficult and expensive to correct. Find out how to give your deployed application the ability to self-diagnose so you can avoid making an eleventh-hour house call. When faced with the task of testing an unfamiliar application, it's sometimes difficult to know where to begin. Discover how exploring with heuristics in mind can help you uncover bugs—even when you don't know what the system specifications are. Most incremental releases resemble grandma's fruitcake-ad hoc pieces of customer requested functionality cobbled together in no particular order. What if, instead, you took a more structured approach—dividing your product into working layers, each one functional enough to use on a daily basis? Learn this foolproof recipe for project success.